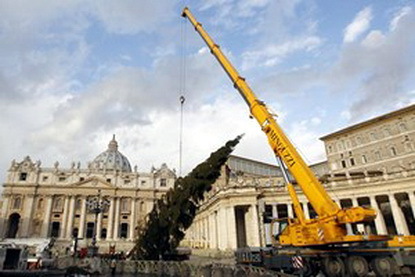 VATICAN CITY, Vatican -- Christmas celebrations officially began at the Vatican with the arrival of a 30-metre (100 feet) high pine tree from Ukraine. Workers erect the Christmas tree, from Ukraine, in St. Peter's Square. The tree was felled last week in a remote area of the Ukraine's south-western region of Transcarpathia and hoisted yesterday in the centre of Saint Peter's square. The tree will be decorated with more than 2,500 gold and silver balls and an equal amount of white and yellow LED lights - which, the Vatican has stressed, are energy-efficient. On 16 December there will be an illumination ceremony attended by a representative from the Ukrainian Orthodox Church. Donating a Christmas tree to the home of Catholicism is considered a great honour and every year a different region or country is given this privilege. Tetiana Izhevska, the Ukrainian ambassador to the Vatican, who was present as the tree was raised, described it as "a symbol of life, symbol of hope, symbol of unity and Christmas joy". It is the first time that the former Soviet country has had the honour since Pope John Paul II initiated the Christmas tree tradition in 1982. Trees have been donated by a number of European countries in recent years, including Romania, Austria and the Czech Republic. Archbishop Charles J. Chaput of Philadelphia, on a visit to the Vatican, was also present on Monday. He called the Christmas tree "a symbol of eternal life for Christians". The Vatican's calendar of December ceremonies says that Pope Benedict XVI will preside over Christmas Eve Mass in St. Peter's Basilica on 24 December and give traditional greetings from the Basilica's balcony on Christmas Day.